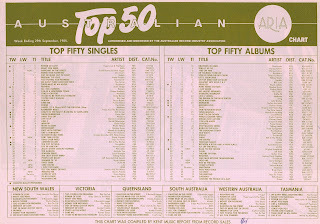 I'm sure it's happened on several occasions, but the ARIA singles chart this week in 1985 was notable for featuring the simultaneous debuts of three future number 1 singles. One was a duet by two of the biggest names in music, another was a collaboration between reggae's premier outfit and the frontwoman of a rock band, and the third was a song by three guys from Norway no one had ever heard of. Before any of those song got to number 1, Huey Lewis & The News defied expectations that INXS would claim their second chart-topper with "The Power Of Love" leaping to the top this week in 1985. 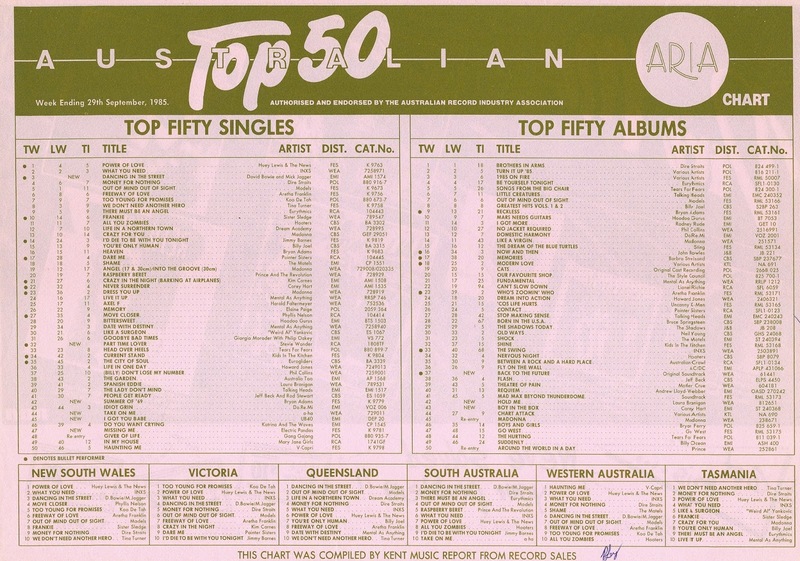 Although, the Back To The Future theme was only number 1 in New South Wales, with a whole host of other songs - including this week's highest new entry - claiming the top spot in other states. Another single not doing as well as its predecessor, "Fortress..." was released ahead of "Love Is The Seventh Wave" in Australia and is my favourite Sting song. Also, nice guns, Gordon. Best known for originally recording "Nothing Compares 2 U", this Prince offshoot only released the one album and this sole single before disbanding. More than a year after their debut single hit the top 20, Electric Pandas finally got around to releasing a second 7". Granted, in the meantime, they had issued an EP (1984's Let's Gamble) and singer Lin Buckfield duetted with James Reyne on the godawful "R.O.C.K. Rock", but neither of those projects made anywhere near as much impact. The lead single from their first full-length album, Point Blank, "Missing Me" also missed the mark - possibly because it was a surprisingly downbeat track from the band best known for "Big Girls". Then again, other than Lin, Electric Pandas had completely changed line-up since then - and seemingly lost its vibrancy somewhere in the shuffle. In 1983, reggae collective UB40 had made an important discovery - cover versions really worked for them. And so whenever the hits dried up with their original material, the eight-piece delved back into the past and had their way with someone else's song. Two years earlier, it'd been Neil Diamond's "Red Red Wine", the first of a string of remakes lifted from covers album Labour Of Love. In 1985, UB40 kicked off their sixth album, Baggariddim, with a version of Sonny & Cher's debut single from 1965. Joining the band on guest vocals was Chrissie Hynde, who'd given UB40 one of their first big breaks - inviting them to tour with her band, The Pretenders, during the (European) summer of 1980, the year the band's first three singles reached the UK top 10. The result of the collaboration: UB40's first chart-topper in Australia and their second in the UK. Their only other number 1 in Australia was also a cover - 1993's "(I Can't Help) Falling In Love With You" - while a reunion with Chrissie in 1988 fared less well locally. Our next number 1 took a couple of goes to become a big hit - three in the UK. Outside Norway, where it reached number 3 in 1984, the original version of "Take On Me" had been a resounding flop. But, thanks to interest in the band from the US, money was poured into making "Take On Me" a hit. And so, following a much more dynamic remix and - more importantly - a new, cutting-edge music video, the version of the song we all now know started climbing charts around the world. 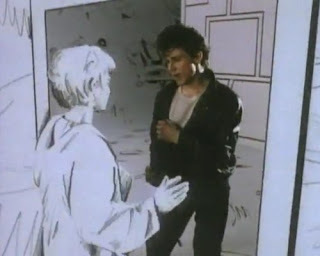 Using the same rotoscoping technique featured in the clip for "What You Need" by INXS, the video for "Take On Me" played a huge part in the song's success. Even though many artists were really starting to push the boundaries with their music videos, the blend of live action and animation in the a-ha clip was like nothing else on TV - and it didn't hurt that singer Morten Harket was pretty easy on the eye. But, the reason why "Take On Me" has endured is that it was always much more than just a tricksy music video. A slice of synthpop so infectious it's almost impossible not to like, the track has been covered and sampled ever since - with the keyboard riff one of music's most recognisable. Often mistakenly referred to as one-hit wonders, a-ha would struggle to match the success of "Take On Me" in Australia, but would land a good number of chart hits in the years to come. Next up, an artist whose time at number 1 would come - but not for another six years. In 1985, Bryan Adams fell just short of the top 10 for a second time in a row as "Summer Of '69" peaked two places lower than big ballad "Heaven". A return to ultra-commercial pop/rock, "Summer Of '69" was another collaboration between Bryan and long-time writing partner Jim Vallance, who disagree about the exact meaning of the number in the title - is it a reference to the year (as the apostrophe would suggest) or the sexual position. Bryan wouldn't see a chart peak this high until his all-conquering number 1 smash in 1991, "(Everything I Do) I Do It For You". From a male singer who had a long-running number 1 hit in his future to one who'd recently scored one - Stevie Wonder was, in 1985, coming off his marathon eight-week stretch at the top with "I Just Called To Say I Love You". What better time to release his 20th studio album, In Square Circle, which featured this lead single? As it turned out, despite the risks associated with a song as massive as "I Just Called...", Stevie hadn't managed to kill off the public's good will towards him and the upbeat "Part-time Lover" duly became his fourth top 5 hit of the decade - and his career - in Australia. Featuring Luther Vandross on backing vocals (and hums), the song would be his last major hit under his own steam, although he provided vocals on Babyface's number 5 hit, "How Come How Long", in 1997. With an entry position like this (beaten only by Band Aid up until that point in 1985), it's no surprise this superstar duet was the first of our three future number 1s to reach the top. But what is surprising is how long it took David Bowie and Mick Jagger's cover of the Martha And The Vandellas classic to actually be released. The record had first been played during Live Aid back in mid-July (since a satellite-linked live performance was technically impossible) - but the charity collaboration didn't debut on the US or UK chart until the end of August/start of September, and reached Australia a few weeks later. I guess in those days, that was considered a speedy release. Everything else about this update of "Dancing In The Street" had been put together incredibly quickly, from the initial four-hour recording session to the half a day it took to make the music video. Although they didn't manage to actually perform the track together at Live Aid, David and Mick would eventually share the stage - unexpectedly - the following year at the Prince's Trust concert. The song remains the only time Mick has reached number 1 in Australia as a solo artist (although he hit the top six times as a member of The Rolling Stones), while it was David's second and final chart-topper, following 1973's "Sorrow". Next week: another brilliant example of European synthpop enters the top 50 alongside three Australian bands that broke down the barriers of the male-dominated pub rock scene. Didn't think I knew the Sting track, but I recognise the chorus, which is good. The verses are a snooze though. 'Missing Me' is another song I assumed I didn't know, but recognise the chorus. I always wanted to know who sang that, actually. Surprising it peaked so low. I remember seeing the Electric Pandas on C'mon Kids one afternoon after school, but didn't think I knew any of their music until 'Big Girls' aired on rage a few years back. It's funny the things music makes you remember. I associate this version of 'I Got You Babe' with being sick at a restaurant during a family holiday (it was playing in the car on the way there). That video seems to use a different mix of the track. 'Take On Me' is a classic, but devalued slightly by being overplayed. I've never liked 'Dancing In the Street' much. "I Got You Babe" by UB40 & Chrissie Hynde was released (just like "Dancing in the Streets") after it was performed at Live Aid, with money raised going to famine relief, so effectively the world wide broadcast helped not only Mick & Dave to land a No.1, but back-to-back Live Aid No.1's in fact (IMO). I wasn't aware I Got You Babe was performed at Live Aid. I know The Pretenders played the US concert, but I can't see the song in the set list? It wasn't - "Anonymous" is mistaken, unfortunately.